With faster, cheaper, and more varied modes of transportation, we at SUN OCEAN CORPORATION stand behind the further diversification and internationalization of logistics as we increase our business and expand our land, marine, and air transportation network. With safe, reliable and fast transport as our creed, we support our customers throughout the logistics process by providing integrated services, from documentation to consultation on import and export. We promote international combined transport to make sure that semi-finished and finished products, raw materials, plant machinery and equipment, and other goods will be delivered from the factory to the destination on a door-to-door basis. We coordinate imports and exports from start to finish. By utilizing our own nationwide network, we support overall import and export handling ranging from customs clearance operations, vanning and devanning, container transportation, and truckage to individual consignees. Moreover, we are actively working on general logistics in Asian nations such as China, Thailand, Malaysia, Korea, and the Philippines. And, as a company that specializes in intermodal transportation, we have a number of highly-qualified employees, including registered customs specialists, international modal transportation specialists, and FIATA diploma holders. We provide smooth cargo handling and storage. We offer warehousing that supports intermodal transportation with highly-functional and effective aggregation and distribution of goods. 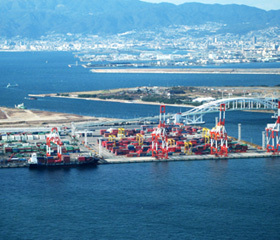 Our company holds bonded areas equipped with modern facilities at Osaka Nanko (South Port) I-2 and Santotsu (pier 3) ST, where we smoothly handle and store cargoes for overseas export and various foreign cargoes imported from overseas.